TALK Boston is a fabulous location for English language learners, as there are so many things to do in Boston, activities that are fun and interesting and wonderful historic, cultural and scenic places to visit and see. Boston is so full of history, the city contains the story of the founding of a nation, has a character all of its own… each season, each month, each week there are loads of things to do in Boston. Let’s start with summer! When: Every Thursday till end of August: family activities start at 5:30pm and concerts begin at 7pm.Where: Charter Street in North End ,provides the perfect setting for family activities and free concerts on Thursday nights. Where: Charter Street in North End ,provides the perfect setting for family activities and free concerts on Thursday nights. One of the residents’ favorite things to do in Boston in summer is visit Chinatown which comes alive with lion dances, martial arts, firecrackers, folk dances, and lots of vendors for the annual Chinese Moon Festival, also called the Mid-Autumn Festival. It’s the perfect excuse to spend an August Sunday in Chinatown. Start with dim sum, and then enjoy the colorful festival. Boston’s North End Italian Feasts and Festivals take place throughout the summer, as they have for 100 years or more – almost as long as Italians have lived in this neighborhood. Most of the North End feasts celebrate a saint with food, music, religious ceremonies, parades, strolling singers, celebrations, and more – they’re like giant street parties. In general, opening ceremonies take place on Friday evenings, with other events starting around 1pm on Saturday and Sunday and continuing until about 11pm. High Mass usually takes place on Sunday morning. St. Anthony’s Feast – The largest Italian religious festival in New England, August 23-25, Endicott, Thatcher, and North Margin Streets, procession at 12 noon on Sunday. Boston GreenFest 2013 offers a huge assortment of exhibits, performances, and presentations about sustainable living. EcoThemes for 2013 include water, energy, green cities, transportation, health, nutrition, and EcoFashion. One Gallon Challenge: Super-light, super-dynamic cars race from Plymouth, MA to GreenFest to see how long one gallon of gasoline will last. Speakers, workshops, and much more! 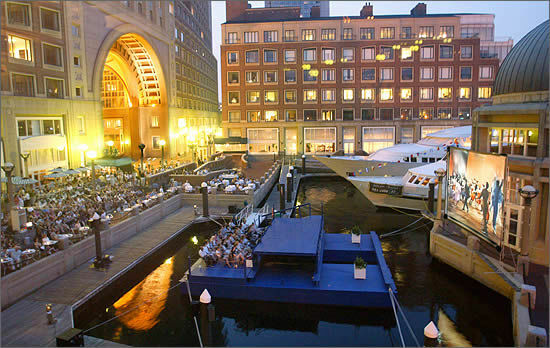 Boston Harbor Hotel’s popular “Summer in the City” series lets you kick back and enjoy free music and movies overlooking the waterfront throughout the summer. 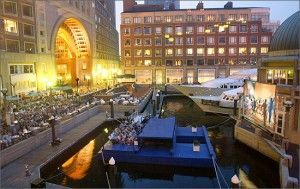 When: On Fridays, enjoy music (starts at 4:30) and movies projected on a large screen over the Harbor starting at dusk. The things to do in Boston are all free, and that’s what’s so great about the city – many of the most special memories you will create of your time there are free!